SOLD $ 129,250! | Middle Tennessee Real Estate :: Maples Realty & Auction Co. This 3 bedroom, 2 bath home with converted garage for an extra room, offers an expandable upstairs and a large fenced backyard. 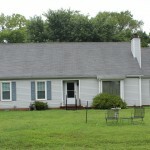 With some TLC, this property will make a nice starter home or investment property. Call Brad Muse for more information. Directions: From Murfreesboro, I-24 W to TN-96 W (Exit 78A) toward Franklin, turn left on McNiel Dr., property will be on the right. correct in assuming there is none? Her estate only included a house and no personal property.